While it's tough to tell on the Smithsonian Channel's site just exactly when this segment on Climbing Monkey Face was produced, it's probably new to most of us. 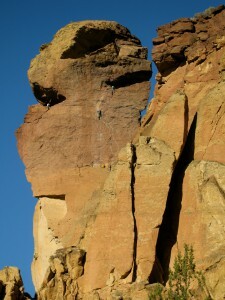 Part of a series of Aerial America, this 2+ minute historical segment on Monkey Face contributes further to Smith Rock State Park's prominence as an international destination for sport climbing. Locals will wonder why the oh-CHO-cos got mispronounced as well as got top billing over the Cascades when positioning the park. And climbers will undoubtedly notice aid climbing happening vs sport climbing from the narrator at one point, but kick back and enjoy it anyway!